A study published in the online edition of the journal Addictive Behaviors finds that teens who drink alcohol spend more time on computers for social networking and downloading music compared to teens who don't drink. So basically, the study suggests that teens who drink engage in normal, 21st century teenage behavior compared to goodie-two-shoes types. An anonymous survey of 264 American teenagers, aged 13 to 17, showed that teens who drank alcohol in the last month used a computer more hours per week for recreational purposes. 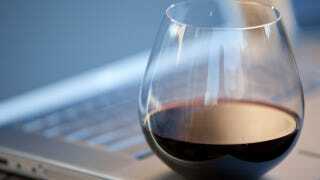 However, there was no strong link between drinking and online shopping—that's for when they become grown-ups.